Welcome to the SD Mom Birthday Giveaway where I give YOU presents for MY birthday! Yay! 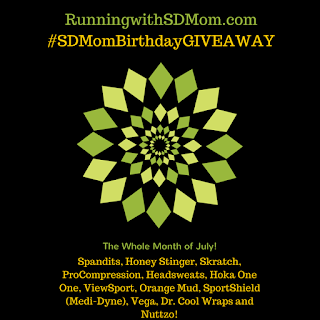 So far, we have a ProCompression giveaway, Skratch energy drops giveaway, Headsweats giveaway, Honey Stingers waffles giveaway, ViewSport giveaway, a SPANDITS Giveaway and a Vega Giveaway! Today, I am giving away my FAVORITE recovery tool - Dr. 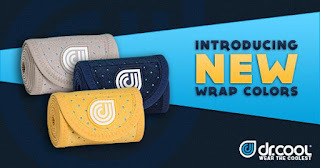 Cool Wraps! I am a little bummed they didn't have that yellow when I got them. From their website: Dr. Cool is the ONLY product to combine ice and compression in one flexible wrap. Dr. 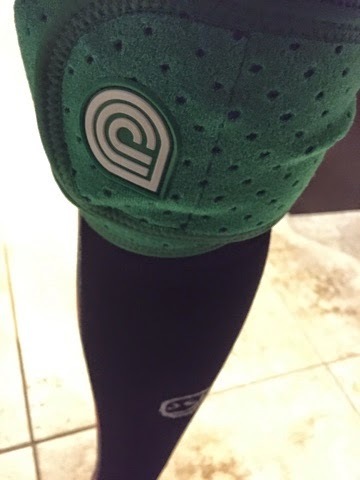 Cool wraps can be used dry as a compression wrap to support and protect various body parts during activities, or frozen to combine cold and compression to reduce swelling and speed recovery mid or post-activity. To use Dr. 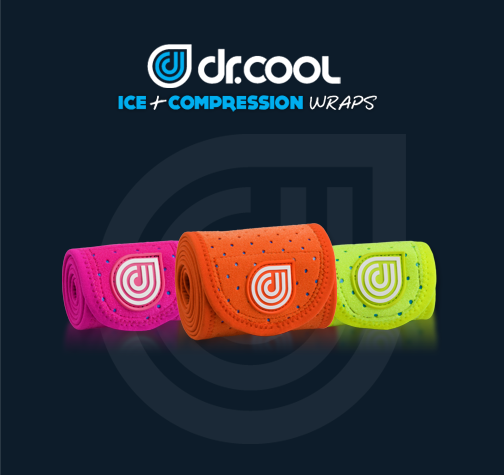 Cool wraps as a cold compress, simply wet the wrap then roll and freeze it; Coolcore’s patented material will keep the fabric colder, longer. But yeah...I will admit my green wraps are pretty sweet! They definitely came in handy for my last marathon training when I decided to try out shin splints! But these gems aren't just for shins. They are big enough to use for your back, shoulders, wrists, quads...pretty much anywhere you feel an ache! Well, now you get to win a wrap of your choice in the color and size of your choice. Please say you will pick yellow! No purchase necessary. Void where prohibited. 1 winner will be selected via the Rafflecopter widget. Open to Residents of the US & Canada 18 years of age or older. Must have a non P.O. Box mailing address. Winner must have a valid email address. Winner will notified via email (if available) and/or blog post, and will have 24 business hours to claim prize. If original winner does not claim prize within 24 business hours an alternate winner(s) will be selected. All winning entries will be verified. If a winning entry cannot be verified as completed, a new winner will be drawn. Winner will be provided the prize directly from Dr. Cool Wraps. Substitutions unlikely but may apply. SD Mom not responsible for failure of sponsor to deliver product. I am linking up this post with Tuesdays on the Run blog link up with My No-Guilt Life, MCM Mama Runs and Run the Great Wide Somewhere. I am also linking up with Sara at Lakeshore Runner for Tried it Tuesdays. So which color would you pick? Which size? Good Luck! Good Luck! I hope you are enjoying these giveaways as much as I am! I could definitely use these for my calves. My calves always give me problems during marathon training! Love my Dr. Cool Wrap! I am currently nursing a hamstring injury so this would be a huge help! My knees are constantly giving me problems....and lately so are my feet. These would be great to help ease that pain! Curious about this...could always use it on my IT Band issues. YES! I have chronic knee pain and this would really help after those long pavement runs! YELLOW!! I have issues with pain in my hip and quad and this would be fantastic! Of course yellow, the color of the happy sunshine!! I have dealt with knee issues in the past, but right now I am running pain free! This would be great to have on hand for the "next time'. My knees get sore on long runs (like 10+ miles) from the impact, which this could be great for. Ice baths help, but this would be nicer to do than that, haha. 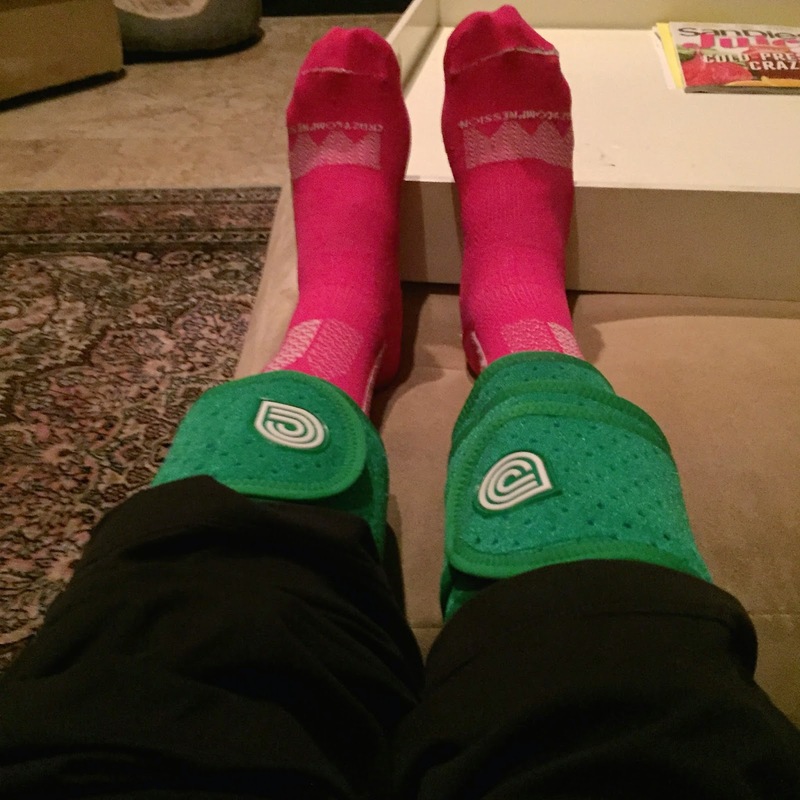 I'm training for my first half marathon, and my legs -- especially my shins and ankles -- need some extra TLC. My back always needs some love, so I've been incorporating more yoga into my training sessions. I have one of those and I love that you can still be mobile while you are icing your leg. A Dr. 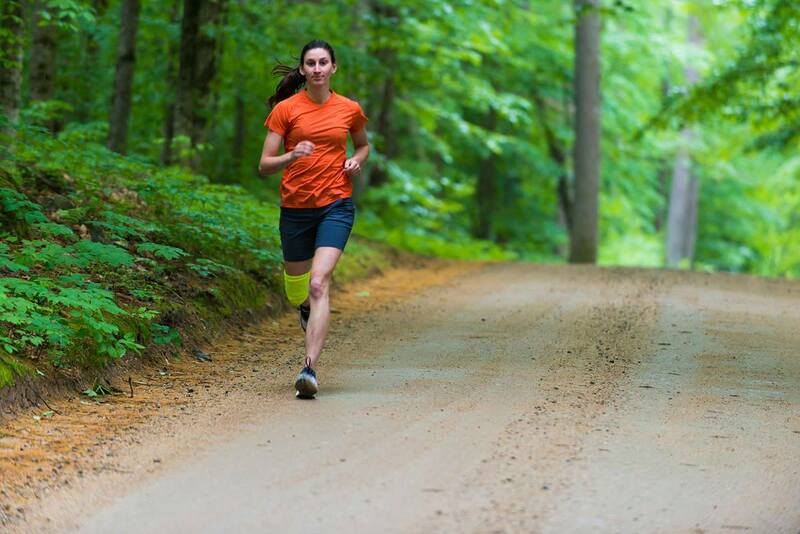 Cool Wrap would be perfect this summer to use during marathon training! I have a set of aging knees that need ice and compression once in a while. I'm actually two months out from shoulder surgery today...I love that these wraps combine cold and compression. These could make recovering from both PT and Half training that much easier! Once in a while my calf feels like it's pulled. I could probably stand to ice it every now and then! I've had a knee injury for twenty-two years, so I try to ice frequently. I had tibial tendinitis and a tibial stress fracture in the spring. These wraps would have been great to have then. I've healed but I continue to ice my legs after runs as a preventative measure. I'm currently battling some shin splint issues so the ice pack and I have become close. These would be a lot more convenient! This would be so nice to have during my marathon training right now! My quads are always sore! A medium in either purple or yellow would be awesome! I don't currently have any injuries but my running buddy does. I like the pink color and a medium would be good. I have aching elbows and this would help. I use an ice pack on my knees after long runs. This would be great! As a newbie I am battling shin splints. My knees were achy today, this would have been handy after my run! I have Achilles tendonitis, so this would help greatly. I actually have something going on behind my right knee (like my hamstring?) and I've been icing it for the last few days. This would have been perfect for that! I'd use this for my knee or shoulder. I want to keep adding miles to my long runs and weekly total, so anything that might help recovery in between would be great! I have one calf that is really bugging me and this would help. Sore knees when I go over 4 miles. I have shin splints too but what I could really use it for right now is my shoulder. I pulled something helping Dad into his wheelchair the other day and it just isn't getting better. I need to ice and compress my elbows...Overuse from lifting weights. Ughhh haha. GUEST POST: Ragnar Relays – WHAT? - WHY? - HOW?